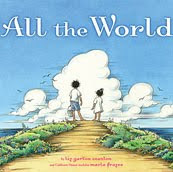 Storysleuths is delighted to welcome back poet Julie Larios, to help us wind up Poetry month with a close look at the Caldecott honor book All the World. Julie previously contributed an insightful Storysleuths post focused on Red Sings from Treetops: A Year in Colors. In addition to being an award winning poet and author of four poetry books for children, Julie, like our previous guest blogger Susan Fletcher, is a fabulous teacher and is on the faculty of Vermont College of Fine Arts, teaching in their Master of Fine Arts in Writing for Children program. The narrative of the book-length poem takes us through the day with one family (eventually opening out to grandparents and friends and neighbors) from beach to farmers’ market, and on to a cloud burst, a roadside diner, and an evening spent with songs, piano, harp, fiddle, babies – a “family” in the widest sense of the word. For any skeptics out there who think it might be too sweet for them, I say read this with a four-year-old and it will win you over. It is not over-sentimentalized. The rhythms are jazzy and the pictures are lively, and its read-aloud-ability is definite. I suspect quite a few parents are already into their hundredth go-around with reading this book aloud and yet not tired of it – for that reason alone, it has the potential to become a classic. All the world is wide and deep. What seems to be working, for me, is the unpredictability of what comes next in each stanza. There’s no real reason that “Body, shoulder, arm, hand” should follow “Rock, stone, pebble, sand” – a lesser poet might have said something more defined about the setting of the story, making sure that the reader understood it from the text, something like “Beach shovels in our hands….” Doing that would have pushed the illustrator towards an illustration. But Scanlon resists the temptation to explain the connection (leaving it to be made by the illustrator) and that is masterful. I often tell my picture book students to trust their illustrators and to remove whatever text tries too hard to paint the picture. Scanlon knows how to do this. All the world is you and me. Not only does Scanlon know how to follow one line with an unpredictable line (she doesn’t say “Someone plays the violin” – she simply implies it, and the illustrator runs with it) but she knows how to find unpredictable images within a line – moving a baby “from neck to knee” – that’s the kind of fresh image and lilting alliteration any good poet for kids would love to have written, because it’s a line that will stick in kids’ heads. Scanlon makes sure that each stanza contains the title of the book, and a list of natural and man-made elements that move the story forward chronologically. All the world is old and new. And so a reader (or a reader with a listener on his or her knee) moves gently through the day. So do many peripheral characters in the book – for example, two ladies on a bike-built-for-two. They show up in one of the last spreads, on the page that shows all kinds of couples – mom and baby, Gram and Gramp, brother and sister, husband and wife. This is a thoroughly satisfying book to read, to look at, to hear. It’s oversize and gorgeous, suitable both for the non-reader on someone’s lap and for an older child looking carefully at the detail –filled illustrations. I can’t wait to read it to my grandson, who (at two years old) already knows what how much fun a trip to the beach is (and who knows a thing or two about cloudbursts, too!). Thank you, Julie. I can’t wait to read All the World to my 3 year old nephews when I visit them next month! To read more by and about Julie check out her blog, The Drift Record, which currently displays stunning photographs and a powerful poem by Gerard Manley Hopkins in celebration of Earth Day. Scroll down to read a poem in which Julie uses only the vowel “o.” Lots of juicy word inspiration drifts in over there.